The Shaking Ray Levi Society, Emmy Award-winning artist Wayne White and hosts of community partners announced Wayne-O-Rama on Tuesday afternoon at the Chattanooga Public Library’s fourth floor. Officials said the four-time Emmy award winning artist and Chattanooga native Wayne White "will astound and inspire with a unique indoor Southside installation, Wayne-O-Rama, which will playfully and vividly recreate scenes and pay tribute to notable figures from centuries of Chattanooga’s rich history with incredible interactive sculptures, giant puppets, large-scale dioramas, immersive sound design and much more." Recipient of four Emmy Awards and Billboard and MTV Music Video awards, Wayne White was also the subject of an Independent Lens film, “Beauty Is Embarrassing,” shown on PBS stations around the country. Officials said, "Imagine Pee-wee’s Playhouse crossed with the Smithsonian – that’s the vision for Wayne-O-Rama, which will serve as a hub of cultural activity for art, education, music and history with events, performances and educational and professional development opportunities." Wayne White said, “This will be like a history of Chattanooga as seen through my eyes and my sensibility. I love history. I grew up with Chattanooga's history. I love the romance of it. I love the characters. Of course, this is also my bid to be a part of the great Chattanooga tourist-trap tradition." The project and the working studio will be in the Southside at 1800 Rossville Ave. in a space formerly occupied by the Chattanooga Folk School and Ignis Glass. The project will host a wide variety of art, storytelling and animation workshops led by Wayne White, including collaborative community events like giant puppet parades, music and dance performances and art showcases. Throughout the project’s year and beyond, it will impact the community and reach diverse audiences, stimulating the imagination of all; young children and adults, all socio-economic groups in schools, universities and under-served communities throughout Chattanooga, it was stated. Maquettes were revealed of installations that will be created during the year by Wayne White, his supporting artists and Chattanooga volunteers. These installations, some 20 feet tall, will remain in Chattanooga. They include Bessie Smith, Lookout Mountain, Chief Dragging Canoe and Bob Brandy. Installations will have interactive elements and some will be mobile, to be featured in parades and events throughout the city. Each model represents a part of Chattanooga’s history that Wayne White has carried with him throughout his celebrated career, officials said. Corinne Hill from the Chattanooga Public Library welcomed a crowd of almost 100 with a projected live video stream showing Wayne White’s office and major awards in the background, kicking off an entertaining afternoon press conference. Johnny Smith, executive director of the McKenzie Foundation, spoke of the impact of the arts, the work of the Shaking Ray Levi Society and Wayne White. Bob Stagner, Shaking Ray Levi Society co-founder, led the guests in a parade of announcements with Wayne’s office and the occasional sound of a banjo in the background. Teal Thibaud and Zachary Atchley from the Glass House Collective announced a community festival on Sept. 24 featuring two-story puppets of Civil War generals who charged the hill 100 years ago, created by Wayne White. "You can see Sherman Reservation from Glass Street, but few of our residents are aware that we have a National Park within walking distance to this community," said Teal Thibaud, executive director of the Glass House Collective. "We have an opportunity to connect our community with nature and history, increase physical activity, and make this neighborhood a more inviting place to live." The Glass House Collective invited the entire Chattanooga community to Glass Street LIVE, an all-day festival. Shaun Townley, vice president of Content and Digital Strategy at WTCI, announced that Wayne White would be featured in November as a guest of the community PBS station’s long-running series, “The A List with Alison Lebovitz,” featured in an episode of the “Greater Chattanooga” series and that the station was fundraising to produce a documentary about Wayne-O-Rama and Chattanooga’s changing relationship to the arts. Meredith Levine, head of Youth Services at the Chattanooga Public Library, said she is passionate about STEAM (science, technology, engineering, arts, math) learning, engaging teens and Wayne White’s art. She said she grew up being influenced by his art and announced that the Chattanooga Public Library will be hosting a series of puppet workshops featuring his art, engaging children and adults from around the community in his art, the city’s history and their creative possibilities. Greg Bagby, principal of Barger Elementary, said two of the Shaking Ray Levi Society’s founders went to that school. Michael Weger from Hixson Middle School noted that Wayne White had attended Hixson Elementary, Middle and High. These schools are education partners in the project. Bob Stagner said Wayne White "still loves Hamilton County teachers and the community that has been so changed by the foundations and art and education organizations working in our city to foster a community where all students have the opportunity to follow that same creative dream without leaving their hometown." Wayne-O-Rama will invite HCDE art teachers/educations to sign up for an Art Exploration field trip experience during six days of programming hosted at the working studio throughout the year. Field trips will include stations that tour the works in progress, engage in an art activity and be a part of a live Skype call with Wayne White. Today’s future-artists from all communities will have the opportunity to learn about him, engage in his art and explore their city’s history through his eyes. Jason McKinney, deputy director of Education from the city of Chattanooga Department of Youth and Family Development, reinforced the city’s commitment to increasing art education for the city’s youth, accepting the project’s offer of Art Exploration experiences for children participating in Spring Break 2017 and Summer Break 2017 programs. Wayne White, adorned with a coonskin hat, appeared on a large screen via Skype, mesmerizing the crowd with his spirit, love of art and dedication to his city, its history and its children. Wayne White, with special helpers, Hain Kim from Tiny Giant and Keeli Crewe from Area 61 (both Chattanooga businesses and special partners and sponsors), described each model, its connection to Chattanooga, Wayne’s history and our community’s future. Describing the event later, Wayne White said, “I was surprisingly moved at the press conference today. Beauty is embarrassing. Additional partner organizations that were announced include Barking Legs Theater, Bessie Smith Cultural Center, Chattanooga Autism Center, Chattanooga State Community College’s Art Department, Creative Discovery Museum, Friends of the Festival, Gig City Productions, Howard School, Jazzanooga, Rock City Gardens, Signal Centers, UTC Art Department, Very Special Arts Tennessee, Winder Binder Gallery and Bookstore and MainX24. Shaking Ray Levi Society co-founder Dennis Palmer, who passed away in 2013, was honored as a creator of the Wayne-O-Rama dream. Founded in 1986, the Shaking Ray Levi Society is a volunteer-run, non-profit arts education organization with an emphasis on increasing opportunities for art programming for students. Support for this year-long project has been generously provided by ArtsBuild, the Benwood Foundation, the Footprint Foundation, the Lyndhurst Foundation and the McKenzie Foundation. 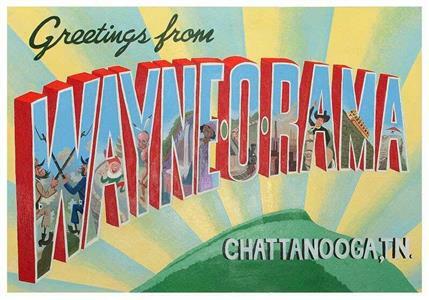 After the year-long installation, The Shaking Ray Levi Society will assure that the sculptures and artwork created for Wayne-O-Rama will remain visible to the public in various Chattanooga locations for many years to come, it was stated. The Wayne White Emmies include three for Pee Wee's Playhouse and one for Disney animation.